He’s miserable for good reason. Because of their large size and double edge, first molars (which usually make their appearance same time between thirteen and nineteen months)are at least twice as hard to cut as incisors – and for many children that means at least twice as much as discomfort. 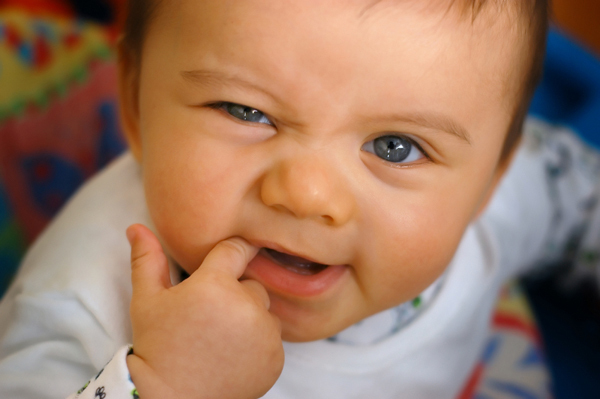 Providing your toddler relief from molar teething pain may be doubly elusive, too. He may be soothed by some of the same standbys that helped him through earlier teething episodes: rubbing the gum with a clean finger; a finger refrigerator-chilled teething ring (don’t use a liquid-filled one, which your child may be able to bite through using his incisors, or a frozen one, which could ‘burn’ his gums) or a partially frozen bagel (once the bagel defrosts, make sure that your toddler can handle the chewed off chunks without choking). Other old stand bys are unsafe now that your toddler has teeth; a chilled carrot, for example, because he’s capable of biting off a chokable chunk; and teething biscuits, because their high carbohydrate content could lead to tooth decay if they are mouthed all day long. Rubbing a bit of brandy, scotch, or other remedy for teething, is not recommended for children at any age. Even tiny amounts of alcohol can be toxic to a child and repeated exposure to the flavour of alcohol could give him a taste for the stuff. If teething pain interferes with toddler’s eating and sleeping, speak to his doctor about the possibility of administering paracetamol when the pain is at as worst. Don’t give your teether medication or rub anything on his gums without his doctor’s okay. The benefits of topical ointments last only a few minutes, and are not extremely helpful. Though many children become cranky and feel out of sorts when teething, and may even exhibit mild signs of illness, report any symptoms (fever, diarrhoea, cough, and so on) to the doctor; they could be completely unrelated to teething and may need treatment. Often, night-waking problems began with molar teething; a toddler wakes with pain, cries out, and finds that waking brings him into Mummy or Daddy’s bed or vice versa- so he continues the practice long after the bouts of pain have subsided. If you’d like to avoid such a situation, respond to your child’s discomfort with comforting measures but not with extraordinary test; though you may intend them to be temporary, your toddler almost certainly won’t.